I have exciting news to report: Kvell has acquired a food processor! (Thanks A). After combing through dozens of pesto and soup recipes for my new kitchen gadget, I went with a recipe I'd had my eye on for a while: Chilled Summer Squash Soup with Yogurt, Mint and Sourdough Croutons. I have to admit I was a bit skeptical of this soup at first. I mentioned in my Summer Gazpacho post that I was wary of chilled vegetable soups, but I found that gazpacho so refreshing, plus was a big fan of every ingredient in this soup- summer squash, scallions yogurt and mint- that I decided to give it a try, fittingly smack in the middle of our third heat wave of the summer. And I'm so glad I did, because I was extremely pleased with the result. The yogurt (I used Greek, so it was extra creamy) yielded a smooth creamy texture, similar to grits, that was perfectly consistency for a chilled soup. Crunchy croutons mixed into each velvety spoonful created the perfect texture contrast for every bite. I had been concerned that a lack of spice or acidity would cause the soup to be bland, but this was not the case at all. Simplicity is key here: the natural flavors of each ingredient mesh perfectly together, and I wouldn't add a thing. I really enjoyed this filling soup and highly recommend it as a refreshing meal for any muggy summer day. I simplified the directions a little bit here by adding some time saving tricks. Instead of using an oven to make the croutons which involved preheating and baking, I lightly toasted the bread via toaster and then pan-fried it in a tablespoon of olive oil for 5 minutes until sufficiently crisp. Also, the original recipe called for letting the soup sit at room temperature for an hour and then refrigerating for 45 minutes....I just refrigerated mine for 15 and found the temperature to be satisfyingly chilled. In Coping with Summer's Bounty of Vegetables, The New York Times officially named today a disease I suffer from every time I go grocery shopping: vegetable anxiety! Citing "C.S.A. subscribers, compulsive farm-stand stoppers and even vegetarians" as potential suffers of this "raw panic", the article details the stress that can ensue from purchasing a bounty of fresh vegetables that so quickly go bad. Luckily, the article offers a solution at the root (hehe) of the problem: Useful Vegetable Tips. Check out the article to learn how to store your vegetables correctly to prolong their freshness. Tricks include separating fruits from veggies, removing rubber bands from bundles, and poking holes in plastic bags. 1. Heat olive oil or butter in a large heavy-bottomed saucepan or Dutch oven over medium heat until melted. Add green onions and garlic and season to taste with salt and pepper. Cook, stirring occasionally, until onions and garlic begin to sweat but do not brown, about 5 minutes. 2. Add summer squash and season to taste with additional salt and pepper. Cook, stirring occasionally, until squash begins to sweat but does not brown, about 7-10 minutes. Add enough water so that squash is almost, but not fully, covered, about 3 cups. Cover saucepan partially and lower heat to medium-low. Simmer until squash is just tender, about 12 to 15 minutes. 3. While soup is simmering, prepare the croutons. Lightly toast 1/2 inch slices of bread in a toaster. Meanwhile, heat 1-2 tablespoons EVOO in a saucepan over medium heat. When bread is lightly toasted, cut into 1/2 inch cubes. Add cubes to saucepan along with salt, pepper and dried herbs (optional) and cook for about 5 minutes, turning frequently until cubes are browned and crisp. Remove from saucepan and let cool. 4. Use a hand blender to blend soup until mostly smooth. 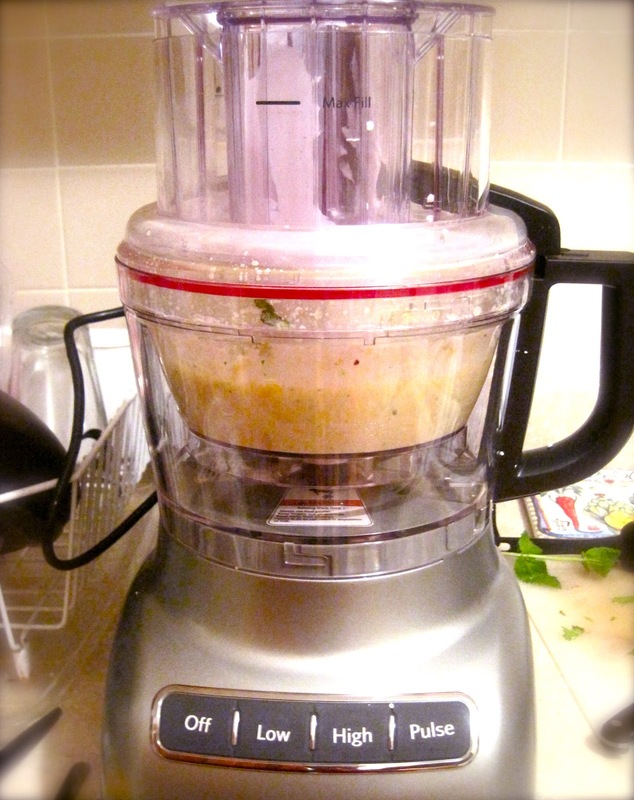 Alternatively, blend soup in a blender in two batches. Add yogurt and mint and blend until totally smooth (again, working in batches if using standard blender), about 1 minute. Strain soup through fine mesh strainer if desired. 5. Let soup cool...for as long as you can make yourself wait. 15 minutes in the fridge "chilled" the soup enough for me. Check soup for seasoning, adding more salt, pepper, yogurt or mint to taste. Serve in bowls, garnished with additional chopped mint and a handful of croutons.